For those of you wondering why there was a giant cheer Saturday night at UNPUB 5 when some random dude in the corner hosted a paper trophy made from construction paper, toilet paper rolls, a paper plate, and a steak-um box, let me tell you the tale of the UNPUB Presidential Race Cup. The UNPUB Presidential Race Cup was an experiment to reward playtesters who participated in race games that possibly play better with more people. A few days before UNPUB 5 I realized there were at least two other racing themed games other than Post Position attending the event. So I reached out to Douglas Schultz (UFO Racing League) and Daniel Solis (A La Kart) to be part of the series. The idea was that players would receive an extra benefit from playing all three games because it would let them play a 4th game, to take home the UNPUB Presidential Race Cup--signed by every UNPUB president in the history of UNPUB. To further reward playtesters, we also created a prize/trophy for each race. The race trophies themselves may not have been made of the best materials (UFO Racing League - Two Styrofoam plates) or presented in the most desirable form (Post Position - shredded money), but they helped create each race into an event itself by rewarding play testers with something they could only get from playing the game. 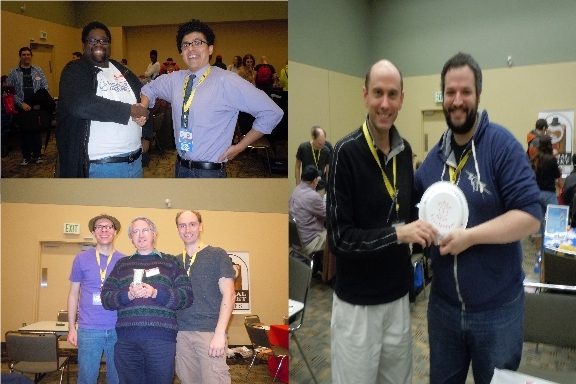 Three players, Johan Kruckemepr, Rob Mitchell, and Marcus Ross signed up for the UNPUB Presidential Race Cup. Each game handles from 6 to 12 players, since there were only 3 players vying to complete the entire circuit, we allowed additional players to compete in each race to win the race trophies and to affect the overall standing of the playtesters fighting for the UNPUB Presidential Race Cup. In a bit of competitive balance, each participant in the series won one of the three races. So it was not a surprise that the winner of the cup, Johan, won by a single point. I asked the Presidential Race Cup participants if the series improved their experience at UNPUB 5? The answer was an overwhelming yes. First, they affirmed that they enjoyed all the game they ended up playtesting. Second, to my surprise, they said how they appreciate the series giving structure to their day. With so many great games to play at UNPUB 5, it was hard to decide which games they should or should not play. By participating in the UNPUB Presidential Race Cup series, they were able to not worry about what they were going to do and look forward to the races they knew they were going to complete. This reaction surprised me because the hardest challenge to recruiting participants was that it required them to commit to playtesting three games at three specific times. On reflection, I wonder by having the event we enabled those who enjoyed having structure to have that option amongst the chaos of UNPUB 5. After the event I asked myself, would I hold a game circuit with a championship again? On the plus side, it created buzz for each game--both at the event and afterwards--and allowed there to be a highlight moment for at least one playtest of each designer’s game. On the downside, its a bit of work. Making the trophy was not too bad, but taking the time to recruit participants ate up a chunk of my morning of the circuit. Looking at it, I think it comes down to what type of game and publicity I desire to consider doing something like this again at UNPUB 6. Creating an event, like a Presidential Race Cup, serves as a way to create post event publicity. There are so many games being playtested and only so many people who write about the event that they cannot cover every game. The only way to ensure your game receives some sort of post convention coverage is to create an event yourself. 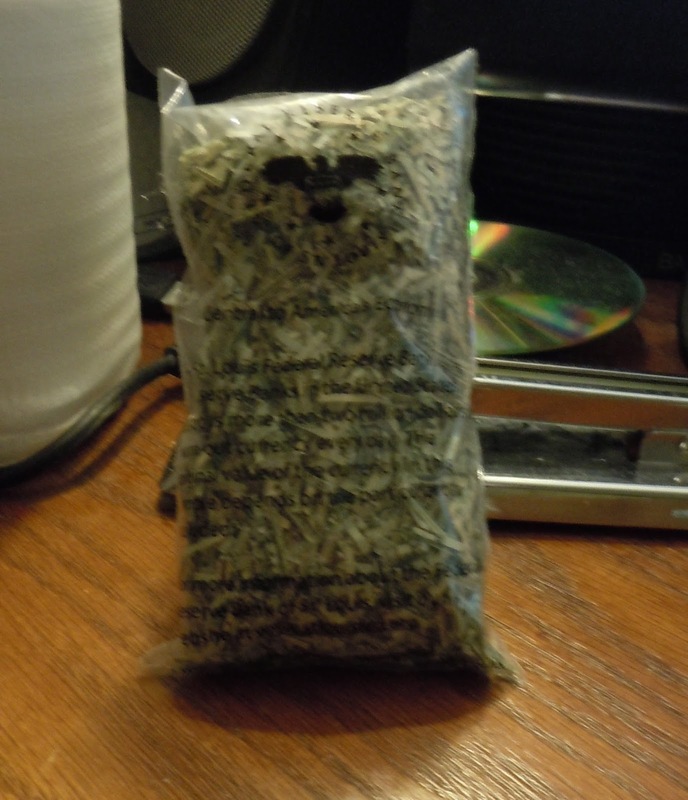 The other reason to consider doing it again was because it was fun. Creating the trophy, building up anticipation for the event beforehand, keeping track of the participants, and having key moments we share with playtesters & designers creates shared memories that all of us will preserve about the awesomeness of UNPUB 5. I want to give a big thank you to Douglas Schultz and Daniel Solis for helping me put on the UNPUB Presidential Race Cup circuit. I also want to thank all the play testers who participated, be it Rob, Johan, and Marcus who competed for the Cup or the other play testers who only competed for a race trophy.